Jack Flaps opened in Ohio City back in December, billed as an “urban breakfast shoppe.” The restaurant is a 40-seat eatery serving pancakes, waffles and other breakfast creations to the masses in Ohio City. 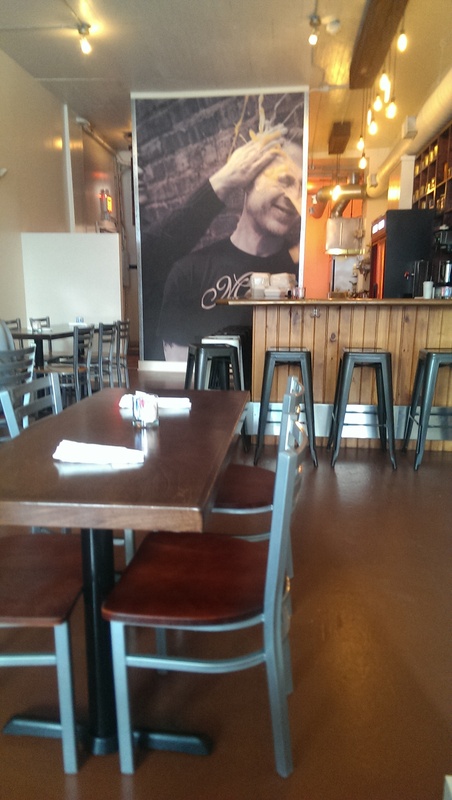 It is a joint venture between Chef Eric Williams and Randy Carter of Momocho. 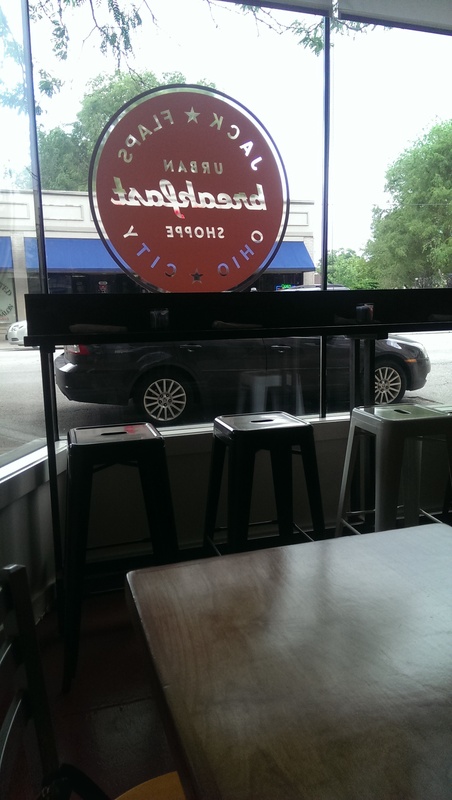 I had heard so many good things about this place since it opened, but I never managed to make it here until one morning I read on my Facebook feed that their Breakfast Bahn Mi had just been named best breakfast sandwich from the Best Sandwiches in America for 2014. I was convinced that it was high time to try the place and headed out within a half an hour. This place did not disappointed. 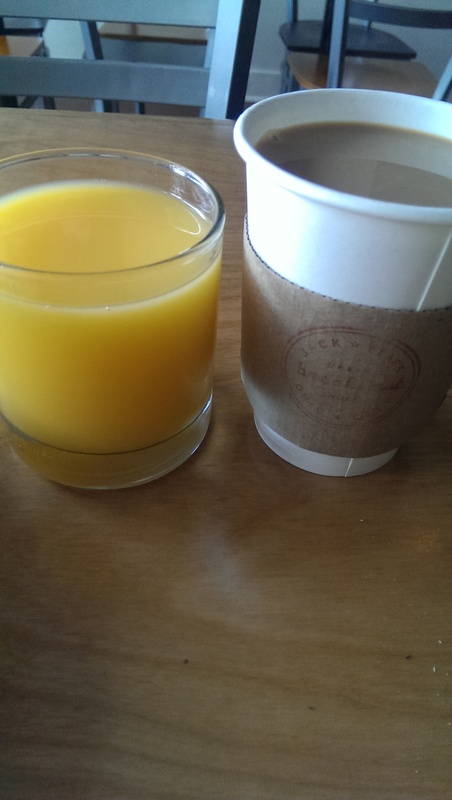 The coffee is a City Roast blend, the juice hits the spot, and they serve Yoohoo. How quirky is that? The coffee is served in a to go cup, and they offer to fill you up before you leave. That is a nice perk. As for the food, I have been back several times. I keep intending to order something sweet, but the savory side of the menu appeals to me more when I am actually there. The Breakfast Bahn Mi is a serious pleasure for the mouth. 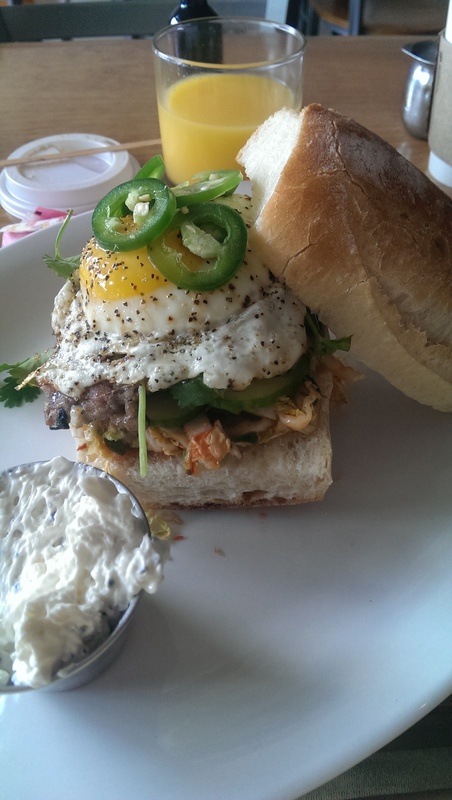 It is a twist on a banh mi with a fried egg, kim chi, and housemade Vietnamese sausage patty. The egg was perfectly runny. The kim chi was not too spicy, not too bland, but juuuuust right. I ADORED the Everything Bagel cream cheese that came with the sandwich. I could seriously just be blissfully happy with the cream cheese and a piece of toast. It is so good! I posted a photo of the sandwich on my Facebook wall, and one of my friends in Chicago who was visiting me within the next few months said he wanted to go there and try it. He loved it just as much as I did. I paired the Bahn Mi with the root vegetable hash. Wow, it is seriously good. 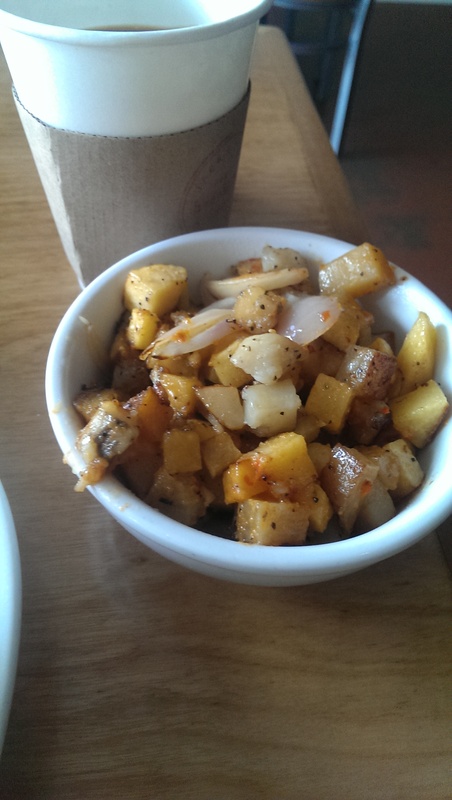 Kind of like fried potatoes, but better because it is made of root vegetables. It had a nice spicy kick to it and was crisp on the outside and creamy on the inside. 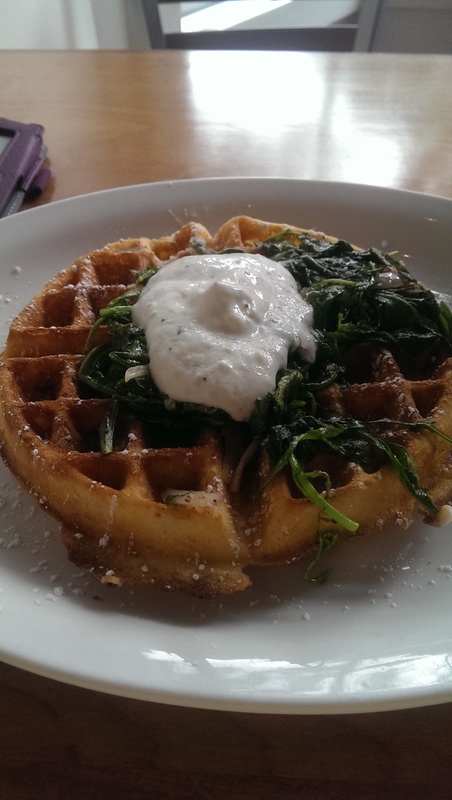 On my next visit I was craving the Everything Bagel cream cheese, so I ordered the Happy Jack waffle, which has an all-beef hot dog chopped up inside the waffle and is topped with garlicky greens and the EB cream cheese. Good God almighty that cream cheese is good. The waffle itself was a little dry with just the cream cheese alone on it, and I would have really appreciated some syrup to go with it. But it was a good waffle, and I left happy. 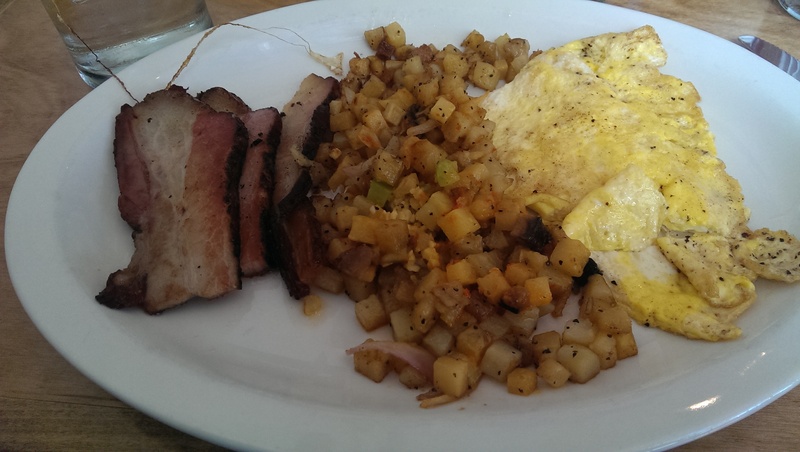 When my friend came to visit I had just started my diet, so I stuck with The Old Standard – two eggs to order (scrambled), choice of breakfast meat (I went with the Mexican Coke-glazed pork belly), the root vegetable hash, and toast. The toast was made from homemade bread and was delicious. It was a crime to just eat the one piece and leave the other uneaten. 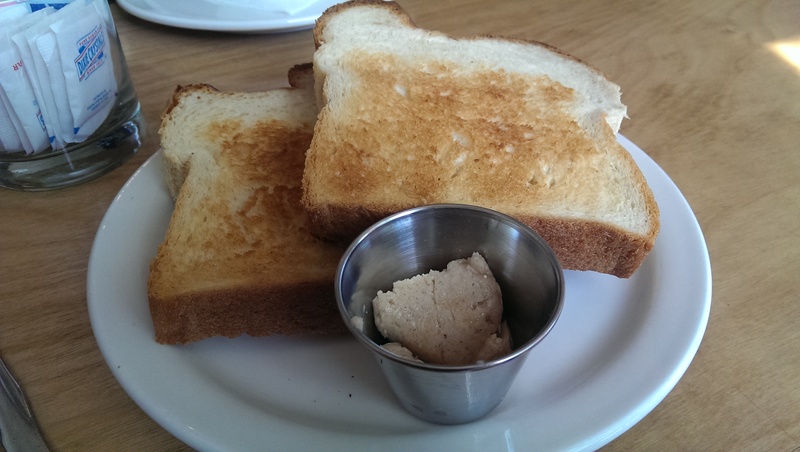 Jack Flaps’ toast gives Lucky’s Cafe’s Como toast a run for its money in my heart. I would be hard pressed to choose between the two. The eggs were well scrambled just like I asked. As for the pork belly, it was good. I have friends who adore it. Me? I’ve come to the conclusion recently that I just don ‘t love pork belly. I love bacon, but I really don’t like all the fat in pork belly. I think it’s a Virgo thing. I ordered the pork belly because I had already had the Vietnamese sausage. I should have stuck with the sausage because it is awesome. I can’t wait to try the S.O.S. and the Deviled Egg Benedict (hopefully they will carry it again next spring or summer). The Fall pancake, waffle and eggy bread choices also sound appealing. Maybe next time I’ll actually order from the Sweet side of the menu. Love Jack Flaps but HATE that pork belly – I was soooo disappointed when I ordered it. I think it’s one of those things that, when done well, is amazing. I’ve had way too many bad examples though. Good to know it’s not just me! Thanks for weighing in, Crystal.